If you want to get a skilled migration visa for Australia, you need to get your Competency Demonstration Report (CDR) approved by the Engineers Australia (EA) assessors. They have explained all their CDR writing norms and guidelines in the Migration Skills Assessment Booklet (MSA booklet). This booklet is to be your first referencing point before writing the CDR. 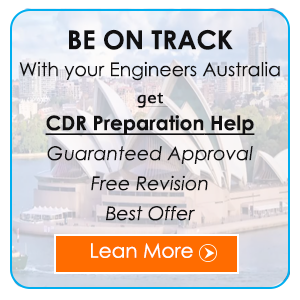 Since the CDR Report approval by the EA is a crucial process, availing the best CDR Report for Engineers Australia online writing services will be the best option for the global aspirin engineers from any discipline. How to Write an Acceptable CDR Report? In the Summary Statement section, you need to mark the specific paragraphs from your three career episodes that depict your competencies. Mark an align these paragraphs very well. After understanding the key requirements of each section of the CDR Report, you will find to know that the Continuous Professional Development (CPD) is a good indicator of all your professional abilities. Here the assessor mostly notes how you have highlighted your growth throughout the working years. What have been your key contributions in the technical project done by you? In this section, you also need to mention all the seminars and workshops attended by you in your entire career. You always need to understand that presentation is a big factor of your CDR Writing Service. The format and you used by you carry a lot of significance. These represent all your efforts and also highlight your technical contributions. You have undergone numerous projects throughout your career, but in the CDR application, you need to write about the bigger and the most significant ones. You need to focus more on demonstrating your professionalism and let the assessors know that you have thoroughly followed all the Standards and Codes all over your project life. Always mention about the rewards and recognitions achieved by you in your career. This can be very impactful. Always say “no” to any plagiarism in the CDR application. Traces of any plagiarism can immediately result in the rejection of your application. It is a good option for you to obtain a professional online CDR Report for Engineers Australia writing services from a trustworthy provider. The casestudyhrlp.com is the best CDR writing online service provider for you. They assure you of CDR sections by the Engineers Australia (EA) assessors in a single chance. Apart from the above services, we also help the students for Assignment Help and case study writing all over the world.